I'm not a particularly fast painter and so am not the overly prolific. However, I'm also rather forgetful, so trying to remember what I've finished (if I haven't posted it here on my blog) this past year is a bit tricky. So, let's begin in April when I began this site in earnest. That was when I finished up my first Kum biker for my Infinity Haqqislam army. He was a fun one to paint and I was all ready to get started on my next Kum biker when my wandering eye caught sight of some friends at the LGS playing something new: Bushido... and soon after that the theme for this year's painting was set. I picked up my Silvermoon boxed set along with Old Zo and steadily spent much of the year working through all of them. After the minuscule detail that is often the hallmark of the Infinity miniatures, the Bushido minis provided a welcome change of pace and I indulged in freehand tattoos, trim and fabric patterns across my Silvermoon warband. After finishing the miniature crime family, my birthday this summer brought the arrival of a new Tengu warband. I've been eagerly laying some paint down on the little birdmen since then, although they'll not see completion until early in 2016. When not working on gaming minis, I also tried to pick a few display pieces to work on. Early in the year, I was finishing my first 54mm piece, the Juglar from Nocturna. 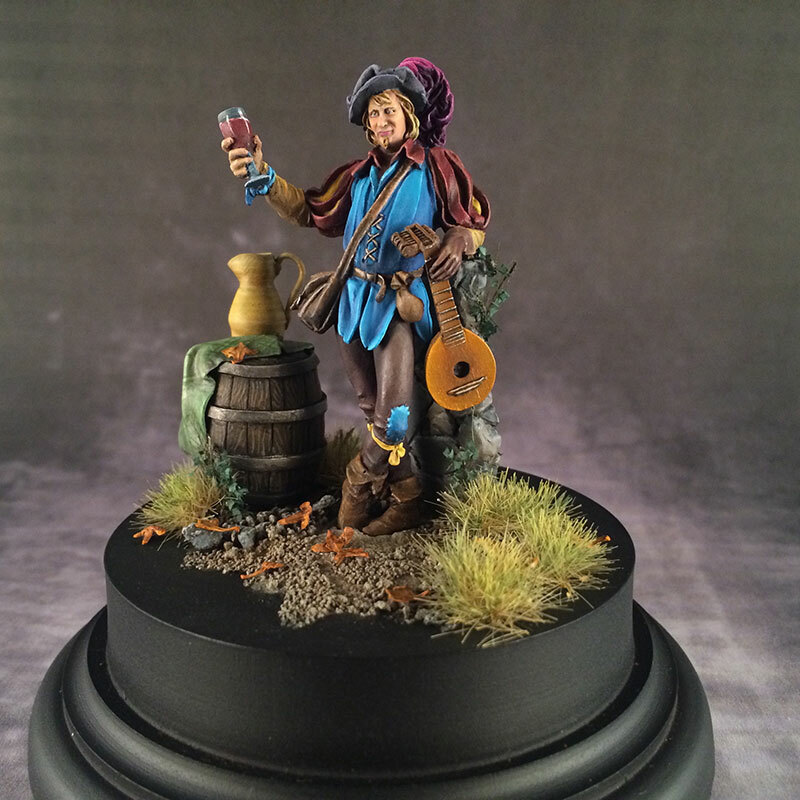 In addition to being the largest mini I'd yet painted, I also tried working a bit more with green stuff and milliput and sculpted a barrel, cloth and wine jug to complete the little scene. My Steampunk Ariel probably represents the longest that I've taken to finish a piece as I worked on her and her watery base on and off for most of the latter half of the year! I'm still pleased to finally have her up on my display shelf! My last non-gaming mini is Enigma's Sumothay. He's still on the painting table and so will also have to wait until 2016 to join the gallery. He's proving to be one of the most detailed sculpts I've painted yet. Part fearsome mercenary, part compulsive hoarder, Sumothay never met a piece of armor, belt or buckle that he couldn't find a place for strapped somewhere on his person. The theme with my gaming this year has been much the same as my painting. While the year began with Infinity being my one and only tabletop game, Bushido quickly made a strong showing and has dominated the number of games played this year. This is partly due to the fun of learning a new game, but a map-based campaign that we ran in our local store for a couple of months in the middle of the year also meant that all my game time was taken up winning and defending my little hexes in the j'war isles. I do regret Infinity falling off a little and after playing again a couple of weeks ago, I realized how fuzzy my gameplay has gotten. While I got a good start with N3 at the beginning of the year, I still have a great deal to learn when it comes to some of the newer rules (like hacking, coordinated orders and suppressing fire) and my instincts surrounding general play have gotten rather dull. When not painting or playing, the other big achievement of 2015 was finally launching this site. While still very much a work in progress, it's been great to spend some time actually thinking and writing about my painting as well as beginning to put together a photo catalog of my work to share. I also created a twitter account, @misterpminis, to both share works in progress, notify about blog posts and tweet the occasional gaming photo. (won't you follow me?). Finish more of the site. I have a lot that I want to do with the site, but if nothing else, in addition to new posts, 2016 will see more of my older miniatures photographed and added to the gallery. Post more! I think I've averaged about a post a month. That's not bad for me, but I can do better and want to try and double that for 2016. In that same vein, I could stand to tweet a bit more too. Try more to join the community online. This site and twitter are nice, but I've as yet been trepidatious about joining some of the community sites like CMON. I hope to get some better quality photos in 2016 and will try and both share a bit more, but also engage with the online community more. I'm very social in person, but much less so online... time to try and change that. Paint a bust. Beyond the 28mm and 54mm minis, my next real painting challenge will be to work on a bust. I've admired some of the incredible busts (sculpts and paint jobs) out there for a long time, but it was really the Shield Maiden series of videos by Ben Komets and Painting Buddha that made me think I might be able to tackle such a challenge. Fortunately, that challenge is very much present in the xmas gift from my lovely wife: Amaryne by Galapagos Miniatures (golly she's a beauty!). Play more Infinity. Infinity is a simply brilliant game and despite my new love of Bushido, I don't want to forget the game that got me back into miniature gaming and play more in 2016. Of course, now I have Haqqislam, Silvermoon and Tengu all fighting for my attentions on the gaming table! Oh yes, and Batman. Yeah... so a few friends at the local store have also started up the occasional game of Batman and I have to admit that I'm curious. Despite never being much of a comic reader, I very much enjoy the current crop of DC shows on TV (Arrow, Flash and Gotham) and so this game has me interested. With the Green Arrow showing up in my stocking this year, I shall have to take the plunge! Well, that all seems doable, right? Right?! Oh boy, time to put down the PS4 controller and get going!